Welcome back to the GPL blog. Today I wanted to talk about the link between inflammation and chronic disease. The mission of The Great Plains Laboratory is to help those suffering from chronic diseases, and recent studies have shown that most chronic diseases are tied to inflammation. In this blog post I am going to give a brief synopsis of some of the most common diseases associated with chronic inflammation and what tests we offer that give insight into how to treat these patients. Inflammation is a response from the body to assist in the elimination of pathogens and to repair tissue damage from trauma. Inflammation is a healthy, natural response to cellular stress caused by stimuli perceived as a threat. It signals the body to bring extra nutrition to sites that are damaged through injury or illness. Without inflammation proper healing could not occur. While acute inflammation is critical to our well-being, chronic, long term inflammation is damaging to cells and linked to many diseases. Chronic inflammation occurs when the immune system believes there is a threat even when there is no immediate reason for this perceived threat. It is still unclear what causes chronic inflammation but lifestyle factors, genetic factors, and internal stressors have all been implicated. Recent studies have demonstrated that inflammation is an underlying contributor to most chronic diseases. Some of the most common of these include cancer, rheumatoid arthritis, Crohn’s disease, depression, stroke, heart disease, and diabetes. Since inflammation is involved with so many chronic diseases, detecting inflammation is an important aspect to managing patient symptoms. Better still, if the underlying causes of inflammation such as Candida, bacteria, mold, food sensitivities, and environmental toxins are determined, the disease process may be reversed. We developed the Phospholipase A2 (PLA2) Activity Test to determine if a specific type of inflammation is underlying the patient’s condition. PLA2 is an enzyme that activates during bacterial infection, cellular trauma, and periods of oxidative stress. PLA2 activates a cascade of secondary messengers that can lead to cycles of inflammation that can self-perpetuate. 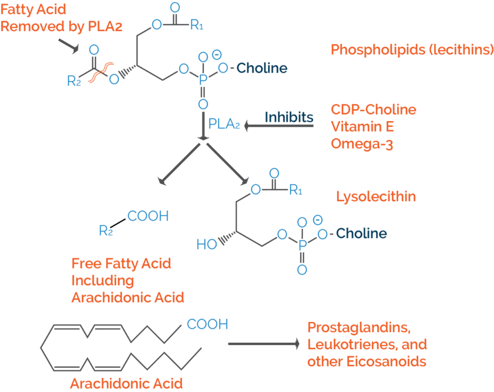 PLA2 metabolizes membrane glycerophospholipids to free arachidonic acid (AA), which is a precursor for the inflammatory signaling molecules, prostaglandins and leukotrienes (Figure 1). PLA2 is expressed in neuronal tissue and is involved in the degranulation process that releases neurotransmitters from neurons. Research efforts have focused on the role that derangement of normal PLA2 activity plays in the etiology of many chronic illnesses. The specific roles, interactions, and interdependencies of PLA2 have been a major area of interest as it relates to chronic inflammatory conditions, cardiovascular disease, and cancer. Measurement of PLA2 is emerging as an important tool for evaluating the chance of cardiovascular disease (CVD), including future stroke, myocardial infarction, heart failure, and other vascular events. Lp-PLA2 appears to be more specific than hsCRP for CVD risk and may also have a pivotal role as a mediator of cardiovascular pathology. In atherosclerosis, PLA2 not only activates macrophages and formation of foam cells, but it also hydrolyzes LDL and HDL, spawning increased numbers of pro-atherogenic small LDL particles, and impairing anti-atherogenic HDL. PLA2 activity may even precipitate bleeding from atherosclerotic plaques. Because PLA2 is a relatively small enzyme (about 14 KD), it is able to be excreted in urine. Our enzymatic assay determines how active PLA2 is in the body, which is mediated by phosphorylation of the enzyme. We have assessed that an activity level of PLA2 activity/creatinine of over 1 results from elevated activity and could be harmful. The literature indicates that Cytidine 5-diphospho-choline (CDP-choline or citicoline) attenuates PLA2 through a number of mechanisms. Most notably it repairs membrane potential and reduces lipid peroxidation. These processes essentially prevent new PLA2 from forming by stopping the cycle of inflammation. Individuals with methylation pathway SNPs may be more susceptible to deficiencies in CDP-choline because it is difficult for them to make phosphoethanolamine, a CDP-choline precursor. Some individuals may have further deficiencies in citicholine due to mutations in their PEMT gene which converts phosphoethanolamine into CDP-choline. Fortunately, this compound is available as a nutritional supplement from New Beginnings Nutritionals and has been used at doses ranging from 500-4000 mg per day in the treatment of patients with a variety of disorders including Parkinson's disease, memory disorders, vascular cognitive impairment, vascular dementia, senile dementia, schizophrenia, Alzheimer's disease (especially effective in those with the epsilon-4 apolipoprotein E genotype), head trauma, and ischemic stroke. A trial in patients with Alzheimer's disease indicated that CDP-choline (1,000 mg/day) is well tolerated and improves cognitive performance, cerebral blood perfusion, and the brain bioelectrical activity pattern. No side effects were noticed except for some mild gastrointestinal symptoms at higher doses. No abnormal blood chemistry or hematology values were found after the use of CDP-choline. Many patients and practitioners are unfamiliar with CDP-choline and may be tempted to use the more commonly prescribed phosphatidyl-choline. These two products cannot be used interchangeably. Phosphatidyl-choline is a glycerophospholipid that PLA2 can use to elicit its inflammatory effects. Individuals with elevations in PLA2 should refrain from supplements containing phosphatidyl-choline and use CDP-choline instead. The Organic Acids Test (OAT) is a comprehensive metabolic assessment of multiple systems in the body. It is one of our best tools in determining the underlying causes of many chronic diseases. The OAT test can be useful in the identification of intestinal yeast and bacteria, oxalates, abnormal neurotransmitters, mitochondrial markers, fatty acid oxidation, nutritional deficiencies, detoxification markers, and inborn errors of amino acid metabolism. Many of the markers on the OAT can help in the diagnosis of inflammation. Some of these include markers for Candida and clostridia. An overgrowth of these pathogenic microbes can lead to disruptions in the gut lining, which can cause inflammation and disrupt the absorption of nutrients. Candida and clostridia can also produce many different chemical toxins that are absorbed through the intestines. These toxins can produce confusion (brain fog), thyroid dysregulation, weight gain, acne, drowsiness, irritable bowel syndrome, and insomnia. There are multiple markers for both Candida and Clostridia. Some of the most common yeast markers are tartaric, arabinose, and carboxycitric. The OAT also has more metabolic markers for clostridia than any other organic acid test on the market. The OAT is able to identify overgrowth from multiple different strains of clostridia. This is accomplished by looking at four different markers which include 4-hydroxyphenylacetic, HPHPA, 4-Cresol, and 3-indoleacetic. These toxins produced by bacteria can lead to inflammation as well as inhibition of neurotransmitter metabolizing enzymes. One of the best markers for inflammation is the succinic acid marker. Succinic acid is generated in mitochondria during the tricarboxylic acid cycle (TCA). Succinic acid is also a signaling molecule which can change gene expression patterns by modulating epigenetic markers in the DNA. Our data indicates that exposure to environmental toxins can cause inflammation, resulting in accumulation of succinic acid. This may be caused by the inhibition of succinate dehydrogenase, an important enzyme that functions in both the Krebs cycle and complex II of the electron transport chain. In the Krebs cycle, it converts succinate to fumarate. In the electron transport chain, it works with CoQ10 to transfer electrons into the complex III phase of the chain. Our laboratory compared patients with high values several common environmental toxins on the GPL-TOX test and determined what their average succinic acid values were. We found that patients with high vinyl chloride, xylene, heavy metals such as lead and mercury, DMP, DEP, and 2,4 D correlated with patients having elevated succinate values (see graph). One additional marker on the Organic Acids Test for inflammation is quinolinic acid. Quinolinic acid is a neuroactive metabolite of the kynurenic pathway. Quinolinic acid is produced from tryptophan through a multi-stage process. Buildup of quinolinic acid increases stimulation to NMDA glutamate receptors and inhibits the reuptake of glutamate by astrocytes leading to neurotoxicity. Studies have shown that chronic exposure to quinolinic acid can lead to structural changes such as dendritic beading, microtubular disruption, and a decrease in organelles in neurons. Quinolinic acid can also increase oxidative stress by inducing NOS activity. Quinolinic acid further adds to inflammation by causing an increase of expression in the inflammatory response elements TNF-α and interleukin-6. One of the leading causes of inflammation is environmental toxicants, which has been increasing every year since the 1960s. This increase in toxic burden observed in our patients is one reason why we have put a focus on providing testing for many different sources of environmental toxicants. We currently offer the GPL-TOX (Toxic Non-Metal Chemical Profile), Glyphosate Test, and metals tests (hair, urine, blood), and we just launched the GPL-MycoTOX Profile, the most sensitive test for mold toxins in the world. If you have any questions about any of these tests, you may review previous blogs about them here or visit the individual tests information pages on our web site. Testing for food sensitivity has been extremely helpful to many of our patient populations. The symptoms of food sensitivity can include (but aren’t limited to) austim, ADD, depression, arthritis, fatigue, skin rashes, and gastrointestinal issues. Our IgG Food Allergy Test is an invaluable tool to determine what role food plays in inflammation in the body. Immunoglobulin G (IgG) is the major antibody found in serum, and our test measures IgG subclasses 1-4. IgG has a much longer half-life than the transitional IgE antibody. Whereas IgE can cause acute reactions to food, IgG can cause inflammation that can lead to more chronic health issues. These IgG reactions can be more subtle and people can live with them for years without realizing what is causing their discomfort. The degree of severity can differ because of genetics or from exposure to different environmental toxins, which can predispose people to immune responses. At The Great Plains Laboratory we offer two different ways to submit samples for IgG food testing – serum and dried blood spot (DBS). We have validated both of these tests against each other and they provide the same result. Our test currently looks at 93 different foods along with testing for Candida antibodies. At The Great Plains Laboratory, we are very focused on helping patients solve their chronic health problems. Research shows that inflammation plays a role in most chronic issues. This is the reason why we have developed so many tests to help pinpoint the root causes of inflammation and to help figure out the best method of treatment. We hope that we can help as many people in the future live better and longer lives. Today I have two words for you: Personalized medicine. What does this phrase mean to you? When I think of personalized medicine I think of treatments that are custom designed for each individual patient, and I believe this is the ultimate goal for all of us in the field of functional medicine. To make this happen, we will have to work together as a team - the healthcare practitioner, the lab, and the patient. If we do so effectively, the result should be better health and improved lives of our patients. The only way to get there is to design a treatment plan that addresses the underlying cause(s) of our patient’s ailments and not try to just suppress the symptoms. When I talk to both practitioners and patients, they often ask “Where do we start?” or “What is your most important test?”, and until recently I would have always said that the Organic Acids Test (OAT) is the obvious place to start. The reason for this is that the OAT provides more information than any other test. The OAT gives us a metabolic snapshot of multiple pathways in the body, offering insight into possible underlying causes of symptoms, as well as what kind of nutritional support is needed. However, now the OAT by itself is no longer the obvious choice. I am now recommending the OAT + GPL-SNP1000 combo because these two tests, one metabolic and one genetic, work so well together. Today I would like to share some of the markers in each of these tests that work really well in tandem. The primary pathways where we see overlap between the two tests are methylation, mental health, detoxification, and oxalate metabolism. The first pathway that GPL-SNP1000 covers is the DNA methylation pathway, also called the MTHFR pathway. This pathway is a process by which carbons are added onto folic acid from amino acid and redistributed onto other compounds throughout the body. This process is responsible for the formation of methionine, S-Adenosyl methionine (SAMe), and thymidylate monophosphate (dTMP). These compounds are then used in neurotransmitter metabolism, detoxification, nucleotide synthesis, and multiple other processes. I can’t say enough about how important neurotransmitter metabolism and detoxification of chemicals are to everyone’s health. We have so many patients for whom the majority of their symptoms result from the upset of these two processes. Since the methylation pathway is so important we decided to make it a high priority in our new genetic test. GPL-SNP1000 looks at 105 different methylation SNPs (single-nucleotide polymorphisms). Next week I plan on going more in-depth on the methylation pathway and how GPL-SNP1000 can be useful. So what markers in the OAT are important for patients with MTHFR mutations? The first one we have is vitamin B12. We evaluate B12 levels by measuring the amount of methylmalonic acid (see Figure 1). B12 is an important cofactor for many of these methylation enzymes. The second important marker is pyridoxic acid, which is a form of vitamin B6. I have counted over 50 enzymes that require B6 in the body. It is an important cofactor in the methylation pathway. It is directly involved with the function of CBS enzyme and indirectly involved with MTHFR, BHMT, and SHMT. Another marker involved with the MTHFR pathway is uracil. Having an elevated uracil level can be indicative of folate pathway malfunction. The next pathway that is helpful to analyze in both the OAT and GPL-SNP1000 is the mental health pathway, which involves the synthesis and breakdown of neurotransmitters in the brain. The combination of measuring the neurotransmitter metabolites and knowing if the enzymes involved are functional will help guide us to the best treatment options. GPL-SNP 1000 covers 14 different mental health genes, which I will cover next week (I’m trying not to make these blog posts too long). Three of the best markers in the OAT for measuring neurotransmitter metabolism are homovanillic acid (a dopamine metabolite), vanilymandelic acid (epinephrine/norepinephrine), and 5-HIAA (serotonin, marker). These markers are the metabolites of the neurotransmitters by the enzymes MAOA and COMT (see Figure 2), the genes for which are analyzed in GPL-SNP1000. Deficiencies in these enzymes due to faulty SNPs may cause low neurotransmitter levels, which may also be caused by low amounts of precursors, cofactors, or increased inhibitors which is why information from both the OAT and GPL-SNP1000 is so incredibly useful. The third pathway that I will briefly touch on today is the detoxification pathway, and specifically for glutathione (GSH). Detoxification is so important in today’s industrial, polluted, and toxic world. Every day we are inundated by hundreds of chemicals. We are exposed to many through the environment and some by choice (like medications). Our bodies have to process these chemicals in some way. GPL-SNP1000 looks at dozens of genes that are important for detoxification. A good marker in the OAT for how well the body is detoxifying is pyroglutamic acid. Elevated values of pyroglutamic acid are indicative of glutathione deficiency due to excessive toxic exposure or a genetic issue. The final pathway I’m going to discuss today is oxalate metabolism. Oxalates are crystalline molecules that we absorb from our diet (high oxalate foods) or are produced by an infection, like yeast/fungal overgrowth. These oxalates can accumulate in the body and cause inflammation. The symptoms of oxalate accumulation include pain, nephrolithiasis, and neurological symptoms. Oxalates are known to cause/create kidney stones. Children with autism who exhibit eye-poking behavior have been shown to have a build-up of oxalates behind their eyes, causing tremendous pain, and thus the eye-poking. GPL-SNP1000 covers five different genes involved with the production and elimination of oxalates. The OAT has three oxalate markers: glyceric, glycolic, and oxalic acids. (Figure 3) In addition, low B6 and increased yeast or fungal markers are associated with increased oxalates. I think that is all I’ll cover today. In the future I will cover the methylation pathway and the neurotransmitter pathway a little more in-depth. If there is another pathway you want me to cover in greater detail, please let me know. I want to be a part of your healthcare team as we all work together for the better well-being of our patients.